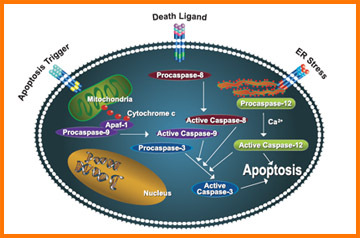 Apoptosis & Related Products | BioVision Inc.
Apoptosis, or programmed cell death, characterized by nuclear condensation, cell shrinkage, membrane blebbing, and DNA fragmentation, plays an important role in many physiological and diseased conditions.Monitoring the cell's progression to apoptosis, detecting the apoptotic cells, and developing drugs that regulate the apoptotic pathways are the essential parts of basic research. Additionally, many diseases like cancer, autoimmune diseases and neurodegenerative diseases, like Alzheimer's Huntington's, and ALS involve either a failure of apoptosis to eliminate harmful cells or the inappropriate activation of apoptosis leading to loss of essential cells. The complexity of apoptosis regulation and the large numbers of molecular players in the apoptotic signaling pathways provide ample opportunity for developing therapeutics to modulate the pathway. Apoptosis can in general be divided into membrane mediate, cytoplasm mediated, mitochondria mediated, nucleus mediated and non-caspase mediated apoptosis. BioVision has developed various assays and products that can detect apoptosis at the early, middle, and late stages in apoptotic cascade. The translocation of Phosphatidylserine (PS) which is normally confined in the inner membrane leaflet of viable cells, to the outer leaflet marks one of the earliest stages of apoptosis and leads to membrane mediated apoptosis. This PS translocation serves as a signal for attack by the phagocytic cells and their further clearance. Annexin V has a very high affinity for the exposed PS and this property has been utilized to make BioVision's Annexin V related apoptosis products. Our Annexin V conjugates are specially engineered to produce enhanced fluorescence signals and photostability, which perform considerably better than other similar products in the market. The Annexin V apoptosis kits are available in flexible sizes and are designed to sensitively and rapidly detect the membrane mediated apoptosis. Caspases, a family of cysteine proteases, with 14 identified members, are the central regulators of apoptosis and are primarily involved in cytoplasm mediated apoptosis. On apoptotic trigger, the initiator caspases (caspases-2, -8, -9, -10, -11, and -12) cleave and activate downstream effector caspases (caspases-3, -6, and -7) and inflammatory caspases (caspases-1, -4 and -5). These caspases then cleave cellular proteins following specific Asp residues, eventually leading to apoptosis. Biovision's caspase related apoptosis portfolio includes numerous caspase staining, activity and inhibitor assays which involve colorimetric and/or fluorometric detection and are simple, straightforward, and 96-well adaptable. We also offer high quality human, mouse, and rat recombinant active and pro-caspases to study enzyme regulation and kinetics, screen caspase inhibitors, determine target substrates, etc. We also offer ready to use caspase inhibitors and sets for pre-clinical research needs. Disruption of mitochondrial transmembrane potential leading to mitochondria mediated apoptosis is also one of the earliest intracellular events that occur upon induction of apoptosis. This leads to the release of cytochrome-c, a key protein in electron transport, into the cytoplasm, which is another characteristic of apoptotic cells in this stage. BioVision's MitoCapture™ Mitochondrial Apoptosis Detection Kit provides a simple and sensitive in vitro assay for detecting the mitochondrial changes in apoptosis. Our Cytochrome-c apoptosis assay kit helps in determining the subcellular localization of cytochrome –c. In addition we have numerous antibodies against key players in the mitochondria mediated apoptotic pathway including the Bcl-2 family of proteins. Chromatin condensation coupled with nuclear fragmentation is another hallmark of apoptosis. Apoptosis induces activation of endogenous endonucleases. The enzyme primarily responsible for this breakdown is Caspase-Activated DNase (CAD). Biovision offers three novel apoptotic DNA Ladder Detection Kits which can be used for quick and highly sensitive DNA fragmentation analysis. We also offer four TUNEL-based In Situ DNA Fragmentation Assay Kits for simple one-step labeling of apoptotic cells which can be analyzed by flow cytometry. In addition to the above mentioned modes of apoptosis, there is increasing evidence for non-caspase mediated apoptosis, involving proteins like Calpains, Cathepsins, Granzymes, and Trypsin. Calpains are Calcium-dependent, non-lysosomal, cytoplasmic cysteine proteases which degrade membrane, cytoplasmic and nuclear substrates, leading to the breakdown of cellular architecture and finally apoptosis. Cathepsins are lysosomal proteases which trigger apoptotic cell death by via various pathways, including the activation of caspases or the release of proapoptotic factors from the mitochondria. Granzymes are serine proteases released by cytoplasmic granules within cytotoxic T cells and natural killer cells to induce apoptosis within virus-infected cells. Biovision products cater to research involving all these mediators in terms of numerous assay kits, enzymes, inhibitors and antibodies. Please use the links below to see the whole list of products for all your apoptotic research needs.